It takes a lot of pressure to make a diamond. And here at Viavi, it takes a lot of hard work. Well, not to make diamonds, but to win diamonds from Broadband Technology Report (BTR). And while they aren’t actual diamonds, these awards are precious nonetheless. 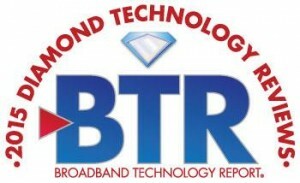 BTR’s 11-year-old technology recognition program, the Diamond Technology Reviews, invites vendors to submit information about products that have been released or upgraded since last year’s SCTE Cable-Tec Expo. Expert volunteer judges (no BTR staff members) review each entry, and similar products from different vendors are reviewed by the same group of judges. Judges’ individual scores are anonymous. Congratulations to the Wireline team on this big win! To learn more about the Diamond Technology Reviews, visit BTR’s website.